Comparison videos are becoming a great way to show off a couple of products at a time, giving potential consumers an easier way to choose their ideal device putting it side-by-side with others to get a decent overall perspective. Today we are looking at how well the smaller handsets are being perceived as we check out the HTC One mini vs. Samsung Galaxy S4 mini. We have provided a video courtesy of PhoneArena, which highlights both devices as we contemplate the call for mini smartphones becoming more prominent within the industry. The video lasts around 11 minutes and questions whether bigger is better as this mini craze is taking root. While we wonder what sacrifices have been made compared to their bigger counter-parts we are intrigued whether these versions are among the best of the mini smartphones? The video like many others nowadays is presented by someone that has a foreign accent which is hard to understand for me, although some may be more atoned to hearing these strange accents regularly may find this easier to comprehend. Generally, I find them irritating, but when I can make out what is being said it is also quite informative. From the outset we get the impression these two are the better when it comes to mini smartphones, and the overall look of the HTC One mini seems to be preferred to the plastic S4 mini. With that in mind the S4 mini is regarded as easier to use. 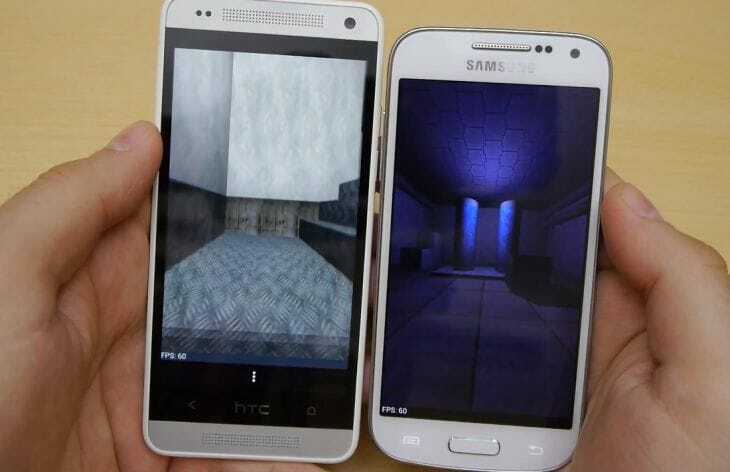 The HTC One mini has a superior screen, and this can be seen when both device are alongside each other. Overall he is impressed by both the HTC One and S4 mini versions, although the S4 is smaller, lighter and easier to handle, while some may prefer the overall premium look of the HTC. They both have their own individual positives, so we would like to know which of the two would be the outright winner in your eyes.